Faster Computers Lead to Slower Experiences? We missed this Blackhat talk back in August, but it’s so good we’re glad to find out about it now. [Christopher Domas] details his obsession with hidden processor instructions, and how he discovered an intentional backdoor in certain x86 processors. These processors have a secondary RISC core, and an undocumented procedure to run code on that core, bypassing the normal user/kernel separation mechanisms. The original Xbox, released in 2001 by Microsoft, was notable for being built out of largely off-the-shelf PC components. With a custom Pentium III CPU and IDE peripherals, the console was much closer to a contemporary desktop computer than any of the dedicated game consoles which had come before it. Which of course makes perfect sense if you think about it. Microsoft would want to use technology they were intimately acquainted with on their first foray into gaming market, and if there’s anything Microsoft knows better than forced system updates, it’s x86 computers. The electricity on the power grid wherever you live in the world will now universally come to you as AC. That is to say that it will oscillate between positive and negative polarity many times every second. The frequency of 50 or 60Hz just happens to be within the frequency range for human hearing. There’s a lot more than this fundamental frequency in the spectrum on the power lines though, and to hear those additional frequencies better you’ll have to do a little bit of signal processing. If you’ve never seen an IBM AS/400 machine, don’t feel bad. Most people haven’t. Introduced in 1988 as a mid-range server line, it used a unique object-based operating system and was geared specifically towards business and enterprise customers. Unless you’re a particularly big fan of COBOL you probably won’t have much use for one today, but that doesn’t mean they aren’t worth playing around with if the opportunity presents itself. This hardware badge is a computer programmed with Lisp. You can write your own programs right on the badge using the built-in keyboard, as long as you know Lisp. If there’s one thing we really like to see, it’s people advancing their own projects based on inspiration from others. The Lisp Badge by [David Johnson-Davies] is a perfect example. With an interface inspired by [Voja Antonic’s] hardware design for the 2018 Hackaday Belgrade Conference Badge, this version is an upgrade of an earlier single-board Lisp machine, now sporting an integrated keyboard. Over on the Cloudflare blog, [Marek] found himself wondering about computer memory, as we all sometimes do. Specifically, he pondered if he could detect the refresh of his SDRAM from within a running program. We’re probably not ruining the surprise by telling you that the answer is yes — with a little more than 100 lines of C and help from our old friend the Fast Fourier Transform (FFT), [Marek] was able to detect SDRAM refresh cycles every 7818.6 ns, lining right up with the expected result. [John Whittington] failed to win a bid for an old VT-220 serial terminal on eBay, so he decided to make his own version and improve it along the way. The result is the Whitterm-220 (or WT-220) which has at its core a Raspberry Pi and is therefore capable of more than just acting as a ‘dumb’ serial terminal. One of the first things we learn about computers is the concept of binary ones and zeroes. When we dig into implementation of digital logic, we start to learn about voltages, and currents, and other realities of our analog world. It is common for textbooks to use flow of water as an analogy to explain flow of electrons, and [Glen Anderson] turned that conceptual illustration into reality. He brought his water computer to the downtown Los Angeles Mini Maker Faire this past weekend to show people the analog realities behind their digital devices. Have you ever had one of those moments, when you’re rummaging through your spare parts heap, and have a rather bizarre project idea that you can’t quite get out of your head? You know, the ones that have no clear use, but simply demand to be born, of glass and steel and silicon? Another day, another vulnerability. Discovered by [Kevin Backhouse], CVE-2018-4407 is a particularly serious problem because it is present all throughout Apple’s product line, from the Macbook to the Apple Watch. The flaw is in the XNU kernel shared by all of these products. You’ve no doubt heard about the “hardware implants” which were supposedly found on some server motherboards, which has led to all sorts of hand-wringing online. There’s no end of debate about the capabilities of such devices, how large they would need to be, and quite frankly, if they even exist to begin with. We’re through the looking-glass now, and there’s understandably a mad rush to learn as much as possible about the threat these types of devices represent. We often lament that the days of repairable electronics are long gone. It used to be you’d get schematics for a piece of gear, and you could just as easily crack it open and fix something as the local repairman — assuming you had the knowledge and tools. But today, everything is built to be thrown away when something goes wrong, and you might as well check at the end of a rainbow if you’re searching for a circuit diagram for a new piece of consumer electronics. It’s not Apple IIs, and it’s not Raspberry Pis. The most important computing platform for teaching kids programming is the Texas Instruments graphing calculator. These things have been around in one form or another for almost three decades, and for a lot of budding hackers out there, this was the first computer they owned and had complete access to. We’ve mentioned previously the challenges that come with maintaining vintage computers which in some cases are pushing 40 years old. Components, even high quality ones, eventually fail and need to be replaced. Now if it’s a fairly popular vintage machine, replacement parts usually aren’t too hard to come by. But what if you’re dealing with a machine that’s not just vintage, but was also such a commercial flop that parts are scarce? [Martin Malý] has put together a sweet little 8085-based single board computer called OMEN. He needed a simple one for educational purposes, and judging by the schematic we think he’s succeeded. Recently I was given a somewhat crusty looking ThinkPad T400 that seemed like it would make a good knock around machine to have on the bench, if it wasn’t for the fact the person who gave it to me had forgotten (or perhaps never knew) the BIOS password. Cleaning the machine up, putting more RAM in it, and swapping the wheezing hard drive for an SSD would be a relatively cheap way to wring a few more years of life from the machine, but not if I couldn’t change the boot order in BIOS. Every year, we demand our computers to be ever faster, capable of delivering progressively more eye-watering graphics and doing it all as reliably as ever. Unfortunately, sometimes, new designs miss the mark. [Cloakedbug] was having issues with voltage regulator temperatures on an ASUS Strix VEGA 64 — one of the latest RADEON graphics cards on the market — and decided to investigate. Old Laptop? Mobile x86 Game System! Between smartphones and tablets, computing is becoming increasingly mobile in nature. It used to be that everyone had a desktop computer, then laptops became the norm, and now many people don’t have anything beyond their mobile device. Unless you’re the kind of person who actually needs the power and versatility offered by a “real” computer, mobile devices are simply a more convenient option to browse the web and consume content. Today’s CPUs are so advanced that they might as well be indistinguishable from magic, right? Wrong! Fundamentally, modern CPUs can be understood logically like any other technology, it’s just that they’re very fast, very small, and very complex, which makes it hard to get to grips with their inner workings. We’ve come a long way from the dawn of the home computer in the 80s, but what if there was something even simpler again, built in such a way as to be easily understandable? Enter the DDL-4-CPU, courtesy of [Dave’s Dev Lab]. Ever wonder why keyboard number pads and telephone dials have reversed layouts? Theories abound, but the most plausible one is that, shrug, it just happened that way. And now we’re stuck with it. Have you ever heard the old axiom that if you want to design a simple system, ask yourself if your grandmother could use it? Maybe that was on Wired’s mind because they asked a quantum computing expert — particularly IBM’s [Dr. Talia Gershon] — to explain what exactly quantum computing is at 5 levels. In the video they shot, which you can see below, [Dr. Gershon] talks to a younger child, a teenager, an undergraduate computer science student, a graduate student, and then a physicist. Is This The World’s Smallest Computer? Have you ever been watching a TV show or a movie and spotted a familiar computer? [James Carter] did and he created a website to help you identify which old computers appear in TV shows and movies. We came across this when researching another post about an old computer and wondered if it was any old movies. It wasn’t. The question of whether to use a mouse versus a trackball is something of a Holy War on the level of Vi versus Emacs. 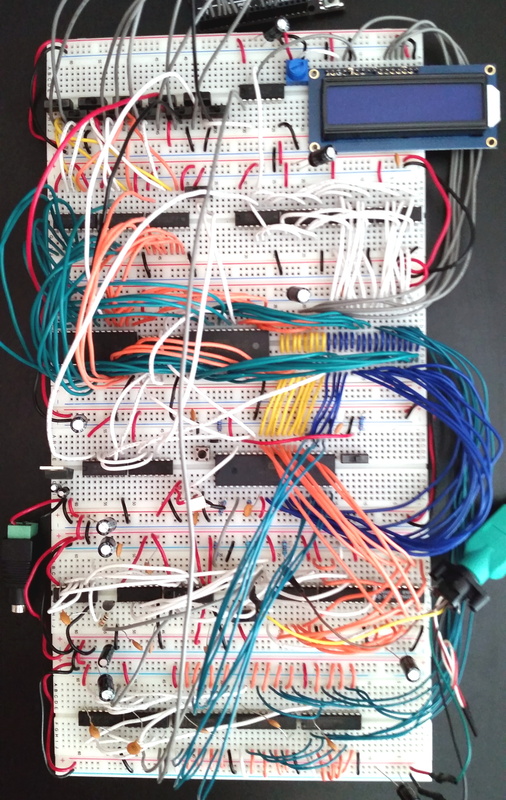 We at Hackaday want no part of such things, use whatever you want, and leave us out of it. But we will go as far as to say that Team Trackball seems to take things mighty seriously. We’ve never met a casual trackball user: if they’ve got a trackball on their desk then get ready to hear all about it. Most of us accumulate stuff, like drawers full of old cables and hard drives full of data. Reddit user [BaxterPad] doesn’t worry about such things though, as he built an impressive Network Attached Storage (NAS) system that can hold over 200TB of data. That’s impressive enough, but the real artistry is in how he did this. He built this system using ODroid HC2 single board computers running GlusterFS, combining great redundancy with low power usage. Among the rows of digital dinosaurs, one blinking front panel stood out. It certainly looked the part of a retro computer; with banks of blinking LEDs and multicolored paddle switches. But upon closer inspection, the laser cut wooden front panel betrays the fact that this machine is an impostor. It may have the appearance of a machine from the heady days where home computers looked like they could have doubled as a prop on the bridge of Kirk’s Enterprise, but it’s actually a product of much more modern provenance. There are a number of companies now providing turn-key computers that meet the Free Software Foundation’s criteria for their “Respects Your Freedom” certification. This means, in a general sense, that the computer is guaranteed not to spy on you or otherwise do anything else you didn’t explicitly ask it to. Unfortunately these machines often have a hefty premium tacked on, making it an unpleasant decision between privacy and performance. It’s UNIX. On A Microcontroller. Many readers will be familiar with interfacing I2C peripherals. A serial line joins a string of individual I2C devices, and each of the devices has its own address on that line. In most cases when connecting a single device or multiple different ones there is no problem in ensuring that they have different addresses. [Tim aka tp69] built a completely silent desktop computer. It can’t be heard – at all. The average desktop will have several fans whirring inside – cooling the CPU, GPU, SMPS, and probably one more for enclosure circulation – all of which end up making quite a racket, decibel wise. Liquid cooling might help make it quieter, but the pump would still be a source of noise. To completely eliminate noise, you have to get rid of all the rotating / moving parts and use passive cooling. High End PC Gets A Rustic Woodwoking Piece Of Art For A Case. As [Matt] from [DIY Perks] was about to assemble a new PC, he decided to take a unique direction when it came to building a case. Despite the appearance of a woodworking piece with weird industrial radiators, there is actually a full-fledged, high-end PC hidden inside. If the computer you have isn’t particularly fast, there’s a well-documented way to get more out of it. You just need more of the same computer, and you can run your tasks on them all at the same time. Building computer clusters is an effective way of decreasing the time it takes for computers to solve certain problems, even if the computers themselves aren’t top-of-the-line hardware. Of course, with cheap enough hardware, people will build clusters out of just about anything, including the ESP32. Collecting old CPUs and firing them up again is all the rage these days, but how do you know if they will work? For many of these ICs, which ceased production decades ago, sorting the good stuff from the defective and counterfeit is a minefield. Testing old chips is a challenge in itself. Even if you can find the right motherboard, the slim chances of escaping the effect of time on the components (in particular, capacitor and EEPROM degradation) make a reliable test setup hard to come by. I was fortunate enough to visit the Trenton Computer Festival last weekend. The show struck a very interesting mix of new and old, commercial and educational. Attendees were writing programs in BASIC on an Apple I (courtesy of the Vintage Computer Federation) not more than five feet from where students were demonstrating their FIRST robot. As far as hobbies go, auditing high security external hard drives is not terribly popular. But it’s what [Raphaël Rigo] is into, and truth be told, we’re glad it’s how he gets his kicks. Not only does it make for fascinating content for us to salivate over, but it’s nice to know there’s somebody with his particular skill set out there keeping an eye out for dodgy hardware. [Rory Johnson] writes in to tell us about PlyTop Shell, a Creative Commons licensed design for a laser cut wooden laptop that he’s been working on since 2016. It’s designed to accommodate the Raspberry Pi (or other similarly sized SBCs), and aims to provide the builder with a completely customizable mobile computer. He’s got a limited run of the PlyTop up for sale currently, but if you’ve got the necessary equipment, you can start building yours while you wait for that new Pi 3B+ to arrive. Computer Associates ARCserve Backup is prone to a remote code-execution vulnerability and a denial-of-service vulnerability. Abstract: Andreas Lange will show the very early computer games before they became a commercial product. If you ever want to know, what was really the first game this session will be the right one for you. Andreas Lange will present the hidden history of early computer games - a story that is only now beginning to be told. While mainstream history usually starts with the space shooter Computer Space, which was programmed at M.I.T. in 1962, the rich games history began much earlier. It is surprising to discover just how strong the contemporary aspects of commerce, science and entertainment were way back then. Want to know what the first game was really like? This is the session for you. Sites designed by S&S Computer Imaging suffer from a remote SQL injection vulnerability. Note that this finding houses site-specific data. Abstract: About p2p-algorithms for fully distributed, totally serverless, fully scalable peer-to-peer systems. Not about specific p2p-softwares. This will only be a very brief overview of p2p-algorithms. This talk is about p2p-algorithms for fully distributed, totally serverless, fully scalable, globally searchable, robust, efficient peer-to-peer systems. These algorithms make it possible to make millions or even billions of computers work together in an organised manner without any central servers, without any computer being a boss over the others. We can now make applications such as filesharing, chat, instant messaging, Internet telephoning, radio and TV (sent from a single home user computer to a billion nodes), distributed calculation systems and many more applications. Since this talk is rather short we will not talk about specific p2p-softwares, encryption, stealth or anonymity. But we will mention some never before published stuff. The talk will be held by David Göthberg who has researched p2p-algorithms since 1997 and full time since the year 2000. Before that he used to work with Internet communication and computer security in embedded systems. (Internet in cars and other machinery.) David has now finished his research and is now working on building a p2p-programming library. So that other programmers can build advanced p2p applications easily, without having to spend years on research first. David's p2p-programming library will be available free of charge for anyone making free software. If you want more information from David before or after the congress take a look at www.pjort.com/projects/ or chat with "Mole2" in the channel #p2p-hackers on the IRC-network irc.freenode.net. Abstract: The evolution of structure in the Universe is one of the hottest topics in Cosmology and Astrophysics. In the last years the so-called $\Lambda$-CDM-model could be established also with great help of very large computer simulations. This model describes a Universe that consists mainly of dark components: 96% are made of dark energy and dark matter. Ordinary matter made up of baryons give only 4% to the total content of the Universe. The talk will present recent results with the main focus on computational methods and challenges in that field. A state-of-the-art computer code for running these calculations will be presented in detail. Abstract: The last 20 years of Internet policy have been dominated by the copyright war, but the war turns out only to have been a skirmish. The coming century will be dominated by war against the general purpose computer, and the stakes are the freedom, fortune and privacy of the entire human race. The problem is twofold: first, there is no known general-purpose computer that can execute all the programs we can think of except the naughty ones; second, general-purpose computers have replaced every other device in our world. There are no airplanes, only computers that fly. There are no cars, only computers we sit in. There are no hearing aids, only computers we put in our ears. There are no 3D printers, only computers that drive peripherals. There are no radios, only computers with fast ADCs and DACs and phased-array antennas. Consequently anything you do to "secure" anything with a computer in it ends up undermining the capabilities and security of every other corner of modern human society. And general purpose computers can cause harm -- whether it's printing out AR15 components, causing mid-air collisions, or snarling traffic. So the number of parties with legitimate grievances against computers are going to continue to multiply, as will the cries to regulate PCs. The primary regulatory impulse is to use combinations of code-signing and other "trust" mechanisms to create computers that run programs that users can't inspect or terminate, that run without users' consent or knowledge, and that run even when users don't want them to. The upshot: a world of ubiquitous malware, where everything we do to make things better only makes it worse, where the tools of liberation become tools of oppression. Our duty and challenge is to devise systems for mitigating the harm of general purpose computing without recourse to spyware, first to keep ourselves safe, and second to keep computers safe from the regulatory impulse. Abstract: Hardware keyloggers are tiny devices that are plugged between a computer keyboard and a computer. They are available for PS/2 as well as USB keyboards. Once plugged, they are able to record all key strokes and store them using an internal memory. Thereby the main focus is to stay undetected. Most manufacturers promote their models cannot be detected by software and thus have an advantage over software based keyloggers. However that's not correct. Hardware keyloggers make slight changes to the interaction between the keyboard and the computer. These changes can be detected by software and used to determine whether a hardware keylogger is present. During this talk various techniques will be presented to detect hardware keyloggers theoretical and practical. Finally a PoC tool will be released, that implements these described techniques. This file documents law enforcements provision related to computer security that the white house is trying to get put into place. It mandates a minimal 3 year sentence for any hacker that damages critical infrastructure. Computer Associates ARCserve D2D r15 Web Service Apache Axis2 world-accessible servlet code execution vulnerability proof of concept exploit. Pianist loses over $6 million in bizarre scam.